Before the holidays, it seemed that President Joseph Kabila had his back against a wall. Having taken too long to decide on a a succession strategy––do I stay and change the constitution? do I leave? who could guarantee my interests?––many of his allies defected, including the most presidentiable of them. He was left with a small cabal of largely unpopular leaders––Evariste Boshab, Lambert Mende, Kalev Mutond, Matata Ponyo and Aubin Minaku. And he was faced with an intimidating coalition that included the Catholic Church, the opposition, civil society, and many international donors. In December, this motley crew gathered in Senegal, creating the Front Citoyen 2016 (with the exception of the Catholic Church). He seemed that if he pushed his luck he would be faced with popular protest, international sanctions, or worse. The new year has brought an apparent change of fortunes for the 44-year-old president. On January 14, the episcopal conference––the decision-making body of the Catholic Church in the Congo––decided to rethink and probably cancel a march they had scheduled for February 16, possibly after Kabila complained to the Vatican. The opposition had pegged its hopes on this march as its main source of leverage against President Kabila; the church’s decision makes widespread mobilization much more difficult. We could see these challenges to mobilization even today, as opposition parties tried to rally supporters on the anniversary of protests surrounding the electoral law a year ago. Police in Kinshasa reportedly arrested dozens today as they tried to nip protests in the bud, even entering churches and barring priests from saying mass. 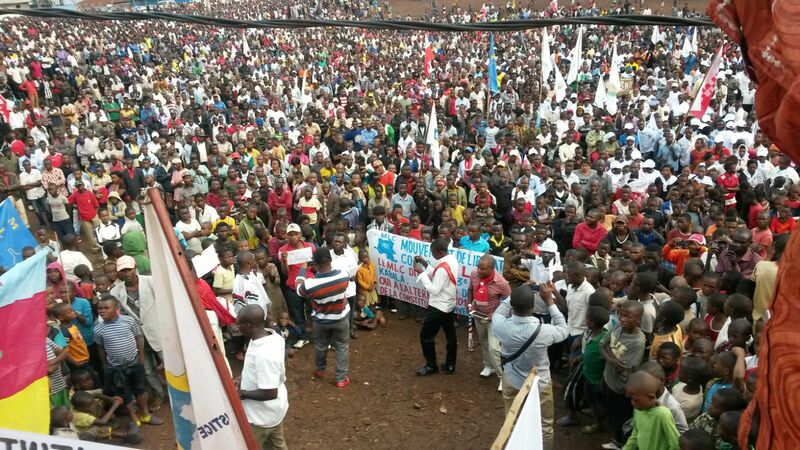 While thousands rallied in Goma and Bukavu, the streets of Kinshasa were relatively quiet. Then the African Union announced on January 14 that they would send former Togolese Prime Minister Edem Kodjo to Kinshasa to help support the political process. While the AU did not explicitly say that Kodjo would facilitate the dialogue, that is what many expect to happen, including the government. The implicit endorsement of President Kabila’s dialogue was greeted with dismay by many in the opposition––the G7 and the Dynamique de l’Opposition, as well as the newly founded Front Citoyen, denounced the AU’s decision, saying that it played into Kabila’s game to prolong his stay in power. But the UN’s representative in the Congo, Maman Sidikou, welcomed Kodjo’s nomination, and Kabila’s advisors expected the rest of the donor community to coalesce around Kodjo now. Already, one can see divisions appearing among the hitherto united opposition. Jonas Tshombela, the head of the Nouvelle société civile, an umbrella group of civil society organization, greeted Kodjo’s nomination, while insisting that any dialogue respect the current constitution. The Voix des sans voix, a prominent human rights group, implored the opposition not to miss this opportunity for peaceful negotiations. And the UDPS, one of the largest opposition parties, appears to be toying with the idea of joining the dialogue. It also didn’t help that Moise Katumbi, the former governor of Katanga who just joined the opposition, just called for primaries to be held to name a common presidential candidate within the opposition. Instead of uniting a fractious group of leaders, that is bound to sow more discord. It will still be difficult for Kabila to change the constitution or even to prolong his stay in power by too long. But 2016 has started on a very different note for the young president.